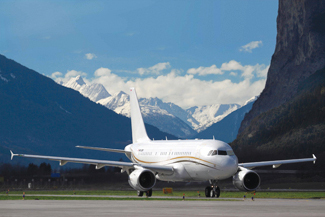 New additions to Tyrolean Jet Services' fleet include two Airbus ACJ319. Tyrolean Jet Services (TJS) is pleased to announce a substantial fleet expansion which includes two Airbus ACJ319 and one Gulfstream G550 for commercial operation. According to Martin Lener ceo of Tyrolean Jet Services (TJS) this is the most extensive expansion since TJS' early company establishment in 1978. "We are more than happy to add two Airbus ACJ319 and one Gulfstream G550 to our unique collection of business jets, which range from ACJ319, ACJ318 ER, Global Express, Gulfstream G550, Gulfstream G200 and several midsize business jets to a Citation CJ2 light jet, now!" This remarkable fleet enlargement in the vvip segment will encourage our continual business development, even in potentially unstable economic times. This is another milestone in Tyrolean Jet Services' organic and sustainable growth. As Austria's longest established business operator with people who have made our business what it is today, TJS offers executive and vvip charter flights, family office style aircraft management services, CAMO and aircraft maintenance services, concierge even airline flights, available at our inhouse IATA travel agency – everything on a 24/7 basis." For more than 30 years TJS have established a solid relationship with charter and aircraft management clients in regard to the safe and reliable operation of its fleet. Tyrolean Jet Services are pleased to announce its participation at EBACE Geneva from the 21st through 23rd of May 2013. During the show, TJS will welcome vip guests to the spacious booth location #449 AND at the static display to present the sophisticated vvip Airbus ACJ318 ER aircraft, which was chosen by Airbus Corporate Jets for presentation at EBACE 2013. Guests attending to the show will have a unique opportunity to discover and experience a “lifestyle beyond expectations” in the very spacious cabin of the TJS ACJ318 ER aircraft.